In Hear This, A.V. Club writers sing the praises of songs they know well—some inspired by a weekly theme and some not, but always songs worth hearing. This week, in celebration of the newly remastered Goodbye Yellow Brick Road, we’re picking our favorite Elton John songs. Elton John is no stranger to pathos. He’s built a 45-year career and more than 30 albums out of it. Even at his most raucous and flamboyant, there’s this weeping-clown quality to the music and his performance of it that makes it utterly fascinating and layered. When I first learned of this week’s theme, I was very close to choosing a different song from 2001’s Songs From The West Coast, “I Want Love,” but then I realized as much as I love that track as a plaintive declaration that the singer is just too broken to ever truly get it together (no matter how much he may want to), it’s really the music video for it that’s worth seeking out. It’s a single tracking shot of Robert Downey Jr. (fresh off his latest backslide and Ally McBeal debacle) lip-syncing the lyrics in this huge empty room; it’s heartbreaking. But, no, my favorite track from that record is actually its album-closer, “This Train Don’t Stop There Anymore,” which finds Elton John looking back on what was probably the most successful, most critically lauded period of his career. At this point in his career, he’d been examining the exacting cost of celebrity as far back as Goodbye Yellow Brick Road, despite his transformation into preening showman. And this tune is a real throwback to the alchemy that has made so many Elton John-Bernie Taupin compositions work. It’s got the contemplative, story-telling lyrics; it’s got John’s soulful delivery and church-organ-like piano-playing; and it’s got a beltable chorus tying everything together. But what, exactly, is John confessing to here? That he was faking it the whole time? With lines like “All the things I’ve said in songs / All the purple prose you bought from me… I never felt enough to cry,” it seems so. But another interpretation could be that the orgiastic nature of the whole experience (as well as his well-publicized drug abuse at the time) was paralyzing and kept him from being the person he was performing on stage ever night. Coincidentally, this song was also given new life because of its music video, which functions a bit as a five-minute Elton John biopic. 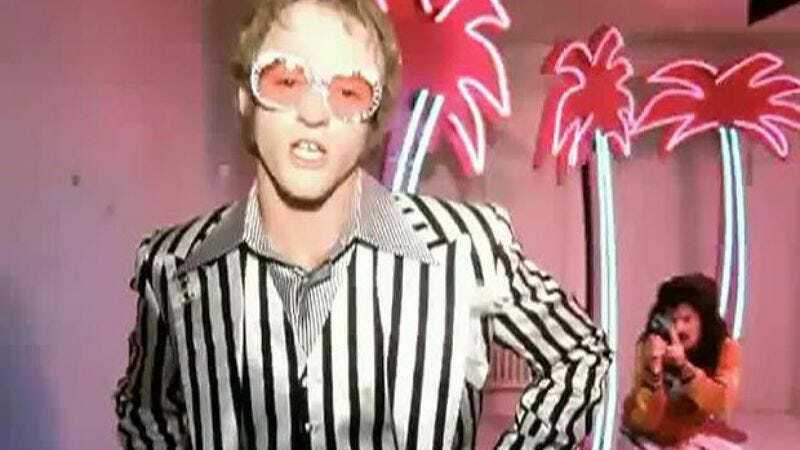 Justin Timberlake plays a Yellow Brick Road-era Elton, complete with receding hair line, gap-toothed dentures, and rose-tinted glasses, lip-syncing John’s disillusioned, confessional lyrics while going through the rockstar motions. John was reportedly so pleased with Timberlake’s portrayal, he lobbied to have the actor-musician cast as the lead in the still-unreleased feature film biopic, a role that instead went to Tom Hardy.